Address: Barlowganj, Mussoorie 248122, India. A tranquil enclave on the hill top of Shivaliks, Jaypee Residency Manor Mussoorie is cradled amidst the lush Himalayas away from hustles and bustles of the Mall Road. 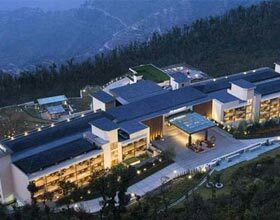 Complementing the grandeur architecture of this exquisite hotel is the cordial conviviality, impeccable services and humble staff which offers a mesmerizing episode of abode in the queen of hills, Mussoorie. The high ceilinged structure and the awe-inspiring interiors are adored by guests along with enormous picture perfect locations to capture the moments with quintessential backdrops. Tamaya, the signature wellness spa of this lavish hotel with steep driveway offers reviving aromatherapies and traditional ayurvedic treatments to active the receptors and a savior after the tiring day of treks. On-site salon and fitness club are the added bliss to this charming encounter. An epitome of opulence lifestyle and modern day class, Jaypee Residency Manor boasts of its 135 well furnished guest rooms spread in the sumptuous property including 4 suites and 41 rooms in the tower with valley view. Other 61 deluxe rooms and 29 executive suites are also facilitated with all contemporary amenities including internet access, DTH television, and espressos maker. These chic-styled rooms have rich upholstery and equipped with kingly furniture. From resplendent alfresco venues with marvelous views of the placid Doon Valley and the mighty Himalayas, to the intimating private in-room dining facility, Jaypee Residency Manor Mussoorie is a retreat where you can choose to dine according to your moods or moments. 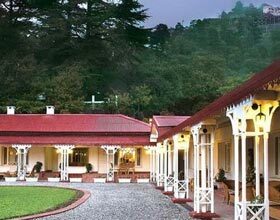 Dining at Regency, an all day restaurant is feast relished by guests during three meals of the day from its delectable fare along with awe-inspiring vistas of the Himalayas from stained glasses of the venue. Snuggle down at Café Manor or The Old Baker to savor the scrumptious snacks, canapés or appetizers along with exotic beverages amidst splendid views of the mighty Himalayas. Marshal's Lounge is a delight for connoisseurs to adore the innovative cocktails or sip the classics from the eclectic collection of wines and spirits. Terrace Grill is a seasonal open air venue.